Kate Jennings Snake, Melbourne, Minerva, 1996, 145 p.
Snake is a short book: only 145 pages and easily readable in one sitting. It is a sharp, gritty book and you know from the opening pages that this is not going to be an easy reading experience. Everybody likes you. A good man. Decent. But disappointed. Who wouldn’t be? That wife. Those Children. Your wife. You love and cherish her. You like to watch her unobserved, through a window, across a road or a paddock, as if you were a stranger and knew nothing about her. You admire her springy hair, slow smile, muscled legs, confident bearing. If this woman were your wife, your chest would swell with pride. Part 2 moves into third person, and is only a little longer- 11 pages and it takes us to their wedding, and already the ashes are in our mouth as we move through the unvoiced thoughts of the unlovely people who make up their extended family. The longest section of the book is in Part 3, where there are short vignettes of the pettiness and the cruelties of everyday life in this blighted family: Irene’s love letter to ‘the other man’ intentionally left where her husband Rex would find it; her moodiness and favouritism, the dog tragically left to die in a car. You know- as you’ve known from the opening pages, that this isn’t going to end well. The final Part IV returns to the second-person voice, but this time it is addressed to Irene. It is short- the shortest part of the book- and bitter. All of the chapters in this book are short – in some cases the title is almost as long as the chapter itself! The relationship of the title to the chapter is often oblique, as is the image of the snake that slides through the book both graphically and structurally. Sue at Whispering Gums wrote a fantastic post about ‘taker-outers’ in books, and this book is just about as spare as you could get. It is as dry and dessicated as the family it is describing, and all the more powerful for that. Lovely post RJ also showing the skill of the taker-outer (thanks for the link) … and your edition sounds gorgeous. 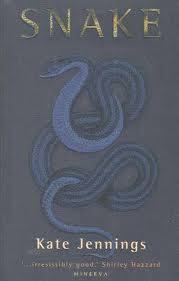 I don’t have the snake image slithering through my 2003 Picador reprint. I don’t think I could manage 145 pages in one sitting myself but thanks very much for the review. Looks like a good read!